Stanage Edge at approximately 4 miles in length and 458m at its highest point is the largest of the gritstone cliffs that overlook Hathersage, Derbyshire. The area is one of the most popular locations in the Peak District National Park for climbing and walking with hundreds of rock climbing routes to challenge all ranges of ability. Walkers are drawn to the area to enjoy the varied moorland scenery with stunning views across the surrounding countryside including Hathersage, Castleton and the 'Shivering Mountain', Mam Tor in the west. A walk along the edge is an easy route but the exposed cliff can make conditions difficult throughout the year as it is often battered by wind, rain and regular snowfall in the winter months. There are a number of popular walks including routes along the remains of a Roman Road and towards Redmires Reservoir to the east as well as longer walks such as those including the nearby Longshaw Estate. 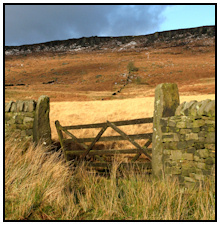 Access to the edge was not always as open as it is today, Stanage and the North Lees Estate used to be a private grouse moor with gamekeepers often bribed to allow access to rock climbers in the 19th century. Further evidence of the past at Stanage can be seen with the abandoned millstones scattered around the area, left here since the 19th or early 20th century when the area around Hathersage was a major centre for the quarrying of these stones once used for grinding grain in mills. The historic North Lees Hall, (image in photography gallery) which is overlooked by Stanage Edge was built in the late 16th century by Robert Smythson, the same Architect responsible for the construction of Hardwick Hall in Derbyshire. The hall is thought to be the model for Thornfield Hall in the famous novel Jane Eyre after Charlotte Bronte stayed in the area in 1845. It is now in the care of the Vivat Trust, a charity set up in 1981 with the aim of rescuing neglected and dilapidated listed historic buildings and is available as holiday accommodation. The unique moorland scenery at Stanage Edge has been popular in recent years with location hunters as a setting for both TV and Film; it was used as a location in the blockbuster 2005 Pride and Prejudice film with Keira Knightley and Matthew MacFadyen as well as in the BBC's production of Jane Eyre in 2006. I provide digital marketing assistance for your business, such as a new website, search engine optimisation, pay per click advertisiing and social media marketing, please contact Meemo Digital Ltd.